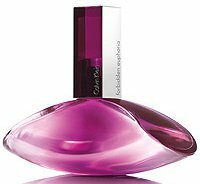 Calvin Klein will launch Forbidden Euphoria, a new flanker to 2005's Euphoria fragrance for women, in September. Forbidden Euphoria is aimed at young women (17-20) and is reportedly younger, sexier and easier to wear than the original. Forbidden Euphoria is a fruity floriental; notes include mandarin, peach blossom, raspberry, pink peony, tiger orchid, jasmine, cashmere woods, patchouli and skin musk. Calvin Klein Forbidden Euphoria will be available in 30, 50 and 100 ml Eau de Parfum. I am taking that to mean it isn’t as strong as Euphoria. I can’t imagine a perfume easier to wear than the original Euphoria. It’s lovely! But there is already euphoria blossom that fits into that category of easy wear?? I know that trying to make sense of flanker titles is a sisyphean task, but shouldn’t something “forbidden” for that age group smell more grown-up, not less? That age group, I think, is not interested in anything that smells like it would appeal to an older market. Fruity Floriental. Wow. I’m so totally jazzed. I totally can’t wait to pick this up. The original Euphoria and the edt version are all I’ve tried, but I love both of them and have a huge bottle of the former I spray with abandon when I’m at home. This sounds pretty and like it wouldn’t overwhelm in the summer, though I hope it isn’t too light and sheer as the lasting power of the original, surprisingly, isn’t all that great. However, the bath and body products are excellent. Can’t wait to try this since it is the first newish CK fragrance I’ve liked in a long time. Bleurgh. That is all I have to say about that. It turns out I have more to say! How much money do 17-20 year-olds have anyway? Given the amount of new fragrances geared to that market they clearly have more money than I did at that age! Oh no, I have become a grumpy old lady at 36…next I’ll start saving my tin foil. Lmao! I actually have been reusing my tinfoil and rinsing out plastic Ziploc bags to reuse and I’m 39! lol But seriously, I think the majority of Generation Y are kind of oblivious to how much things cost. My friends that are 5-10 years younger than me don’t understand me when I tell them I can’t go out on the weekends with them because it’s too expensive. I quit doing that several years ago after I started adding up some of my weekend bar tab receipts! Groceries are more expensive. Everything is going up and not just by a few cents!They’re a generation that has only known prosperity, I guess. I’ve been alive to experience my grandparents stories of the Depression & WWII, the gas crisis of the 70s, the midwest farm & job crisis of the 80s. It’s all in your perspective I guess. Baby, I’m 29 and I’m saying the SAME bloody thing. We’re not grumpy, we just have common sense! Oh that’s what it is! lol!!! Targeting the 17-20 year olds which means the 13-16 year old perfumistas will want it very badly! And of course, the name ‘forbidden’ only makes them want it even more. And me, the mean ol mom that I am will say no, you are way too young for mom to spring that amount of money on perfume that you will wear once to impress your friends and then forget about. So, I will wait it out and hope to get a sample size instead to stuff in her Christmas stocking. Ahh to be a young rebellious teenager again with access to Mom’s money! Or better yet, wait a few months till it shows up on http://www.perfumezone.net where prices are rock bottom. You can get yourself a bottle of something you’ve wanted for awhile to soften the shipping costs and she can do dishes for a month to pay for it. That’s what I did you my niece when she wanted Euphoria Blossom that retailed for around $60 after sales tax. Easier to wear, hm? I remember that as I was 20, I had a bottle of Shalimar and a bottle of Chanel No. 5, and I liked both very much. I know! I started wearing Shalimar at 15 and loved it. Also, my grandmother’s vintage Arpege! Hi Robin, is there any way for you to tell if this fragrance has been discontinued? They pulled it from Sephora around a year ago I think, and now it seems that the price for it has gone up on perfume websites like FragranceNet. I’m not sure if this is a cue for me to stock up? Please let me know if you have any tips on this, I don’t know how long a fragrance even sticks around after they stop making it….Thank you! I’m sorry but there really isn’t, and I’ve given up on asking brands — they’ll say no, it isn’t and then you’ll watch it disappear, or they’ll say yes, it is, and then 6 months later all the stores will restock. So it’s useless…if you desperately love something, stock up. I do see that Macy’s still stocks it though.